The European frog-bit (Hydrocharis morsus-ranae) is thought to have been first introduced to St. Lawrence County in New York in 1974. The distribution map from the NY Flora Atlas (below) shows the counties where specimens have been collected. This map does not appear to reflect the current distribution of this species. I have observed it at Raquette Lake in Hamilton County and at Three Rivers in Onondaga County. It likely spread to the latter area from Oneida Lake via the Oneida River. 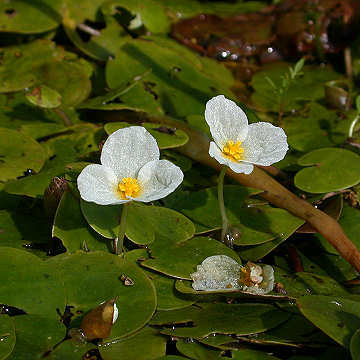 This species looks like a tiny water lily with 3 white petals. It might be confused with the native Nymphoides cordata, which has 5 petals. There is an American frog-bit (Limnolobium spongia) that is native further south of New York and is occasionally introduced. It differs from the European frog-bit in having branched (rather than unbranched) roots, petals less than 1.5 times as long as the sepals (rather than more than 1.5 times as long), and one stipule per leaf that is attached below the petiole (rather than 2 free stipules).